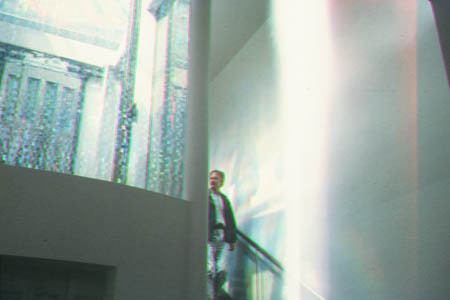 Glass Elevator enclosure at the topmost floor of the Gallery of Modern Art, Glasgow, Scotland. Light from surrounding windows and skylight above, is directed by mirrors mounted to enhance the spectral arrays cast on the walls of the elevator waiting area and adjoining spaces. The doors of the elevator (slide 8) move with the elevator from floor to floor, bringing the spectra down to lower floors as it travels.